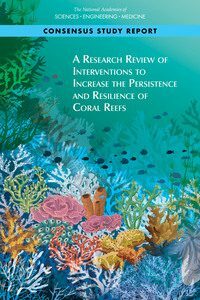 A Research Review of Interventions to Increase the Persistence and Resilience of Coral Reefs is the first report of a two-phase study evaluating the benefits and risks of implementing novel approaches to increase coral reef survival in deteriorating environmental conditions. The report identifies and describes the state of research on a diversity of approaches that target the genetics, physiology, ecology, and local environment of coral reefs. This report is a benchmark that reflects current research, identifying efforts that range from those potentially feasible now to those that offer promise on a decadal time scale.